More than 20 square miles of vacant land lie within Detroit city limits. The legacy of decades of depopulation and disinvestment, these vacant plots drain the city’s resources and pose threats to neighborhood safety—but they also hold great potential for outdoor recreation, job creation, affordable housing, food security, small businesses, clean air and water, and climate change resiliency. Today, The Trust for Public Land is working with city leaders, urban planners, and neighborhood groups to put that open space to use for the community. We’re starting with the Fitzgerald Revitalization Project, which will repurpose ten acres of dispersed city-owned vacant land in the city’s Fitzgerald neighborhood. Working with local partners, we released an RFP to design and landscape architecture firms, requesting proposals for land-based strategies that make life better for Detroiters. Starting in spring 2018, Fitzgerald residents will start to see changes on vacant lots throughout their neighborhood. From community gardens to urban agriculture to sustainable forestry to flood control, Detroit is exploring the possibilities for productive, self-sustaining use of its open space. The Trust for Public Land is proud to be a part of the innovative coalition of agencies, neighborhood leaders, and foundations that are helping Detroit reimagine its potential. 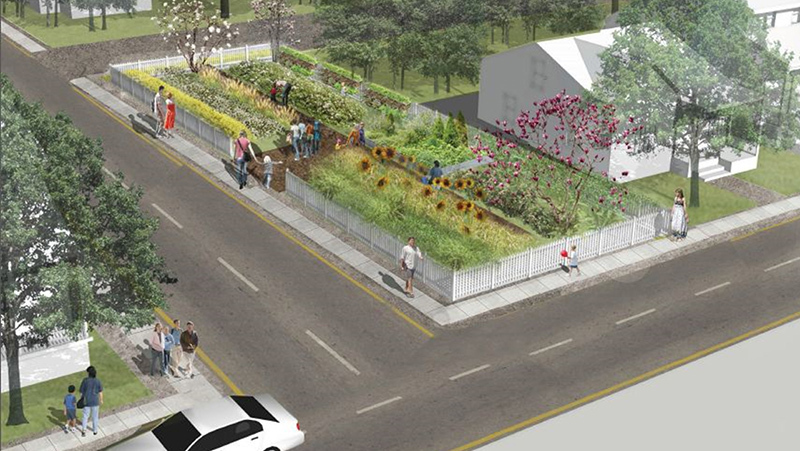 The Fitzgerald Revitalization Project was recognized with a Professional Award from the American Society of Landscape Architects and is inspiring equitable and innovative landscape-driven approaches to revitalization in Detroit neighborhoods and across the country.